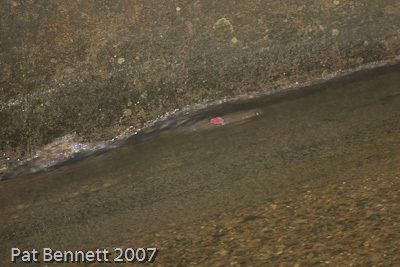 A couple of years ago, in 2007, I photographed sea trout passing a weir on the River Alyn in North Wales. The weir seemed to be designed poorly as far as the fish were concerned. Many attempts resulted in them cartwheeling through the air, and landing on their backs. 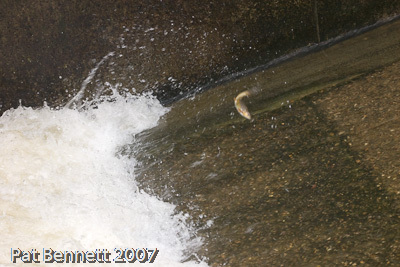 Several fish appeared to carry wounds, as on the back of this fish attempting to take the weir along the wall. 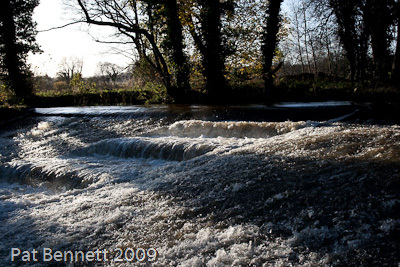 In a sunny interval between the rain which has been coming down for days (November 2009), I went to the next weir on the River Alyn downstream, at Rossett, and spent two hours trying to capture sea trout and salmon in mid-air as they tackled the weir. This was the only successful shot - the salmon did not make it over the weir. 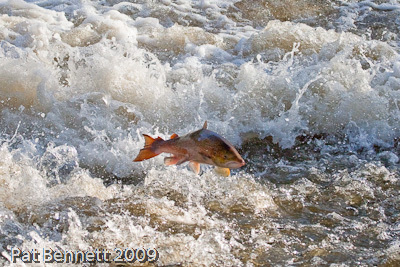 During that time, salmon and sea trout continually attempted to pass the obstacle. The salmon frequently jumped the standing wave at the bottom of the weir and swam frantically up the racing water, which was deep enough to cover their bodies. Some made it right up to the top, to the final ledge, only to be swept down the concrete slope on their side, exhausted by the effort. The sea trout made no progress up the slope at all - they jumped the standing wave, to be immediately swept back into the foaming water. As far as I could see, no fish made it over the weir, despite the apparently favourable conditions. I was exhilarated by the experience, watching the fish battling heroically against the odds, thinking of their long journey to this place. No natural obstacle would have held them back, and I felt a sense of shame when I left, that we were thwarting them from achieving their destiny at the climax of their lives. Obviously some sea trout make it in some water conditions, as I have seen them attempting the next weir upstream, but the wounds some of them carry show they paid a price. If we take the responsibility of managing a river, should we not ensure that our management takes into account the needs of the wildlife that depends on it, but particularly the magnificent salmon? I've spent some time photographing the salmon at Rossett weir now, so I have made the best pictures available in my Salmon Gallery.